Provide shade while generating clean solar energy. 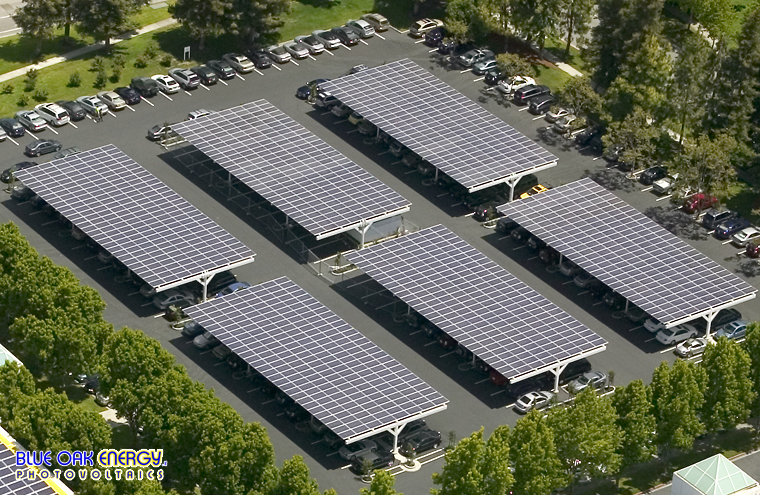 Solar carports provide valuable parking lot shade while generating clean energy for reduced utility costs. 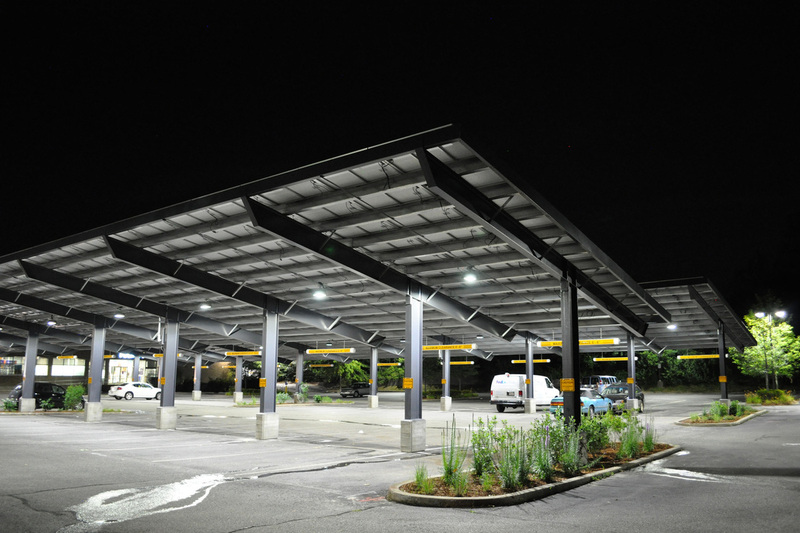 Solar carports can also significantly improve a parking area’s overall lighting. This is due to the fact that the lighting is now closer to the ground, with a reflective material located above the parking lot’s finished surface. When landscaping is incorporated around solar carports, your new energy generating facility can also become a wonderful addition to the property. The requirements for installing a solar carport are fairly straightforward. In North America, carports are typically tilted ten degrees to the south or to the west. There are many issues to take into account during the engineering of a solar carport project. Lighting, soil parameters for foundation design, and changes to disabled parking areas and landscaping are just a few examples of how a solar carport project can impact a parking lot’s design. Geotechnical issues, such as soil load bearing pressures, are important to understand at any particular solar site. The soil’s ability to withstand vertical and lateral pressure are the key design parameters in determining the size of a structural footing. For solar carports or ground mounted solar arrays in seismic zones, the footing’s ability to withstand lateral loads is what determines the solar array’s ability to continue standing. At Blue Oak Energy, we have a very specific approach to designing footings and solar array structural systems. 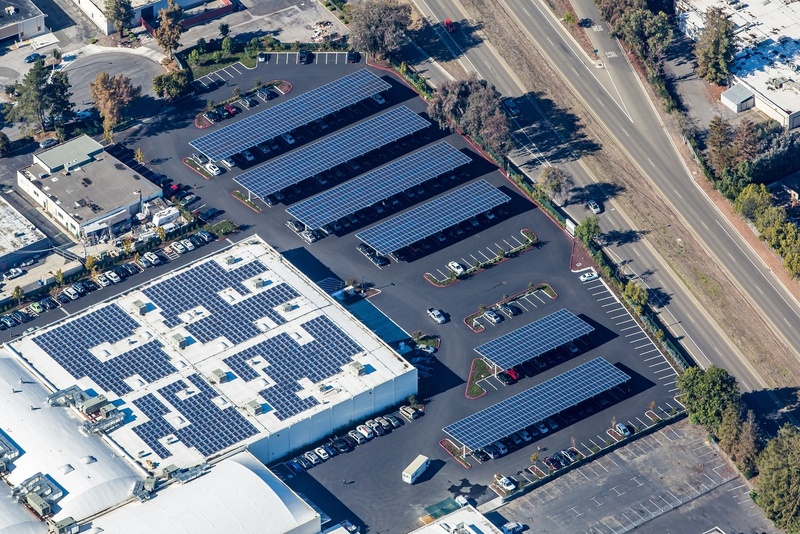 Blue Oak Energy has engineered and constructed solar carports across diverse geographies, including hurricane wind zones and California seismic zones. Our client portfolio includes private corporations as well as federal governmental organizations such as the US Navy, the Marines and the USVA. 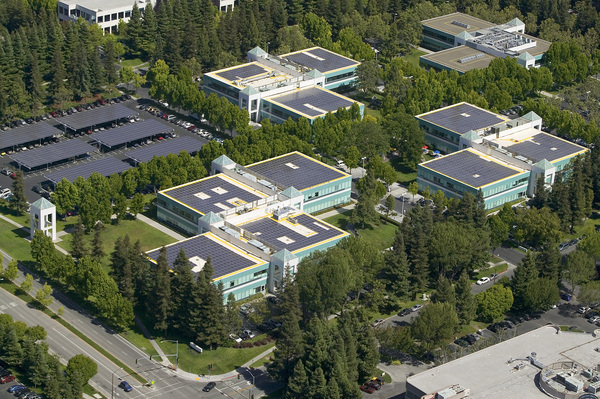 We are skilled at both the engineering and permitting phases of complex solar projects. Please give us a call to discuss how we can help with your next solar carport project. Franklin Realty engaged Blue Oak Energy to build this solar carport system for their tenant Abbot Laboratories. The system is comprised of a 548 kW net metered carport system. 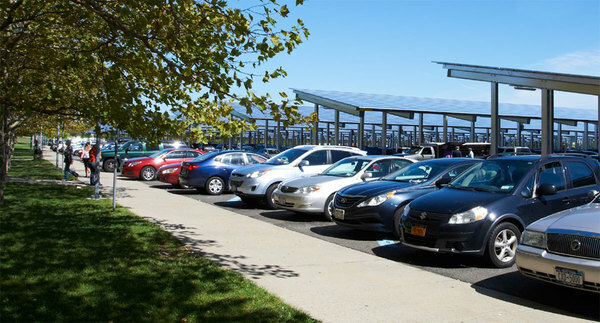 The Eastern Long Island Project (ELISP) is the largest combined carport installation in the state of New York with over 21 acres of solar panels installed across six different sites. The combined 12.8 MW photovoltaic (PV) system feeds power directly to local electric utility, The Long Island Power Authority (LIPA). 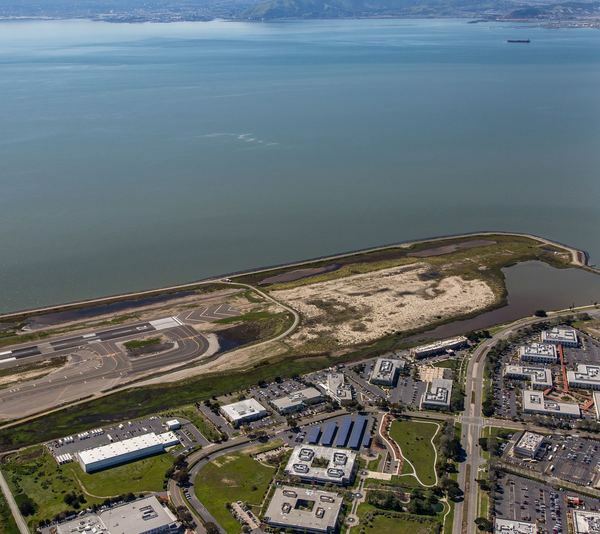 Blue Oak Energy worked with a multidisciplinary team of engineering firms, contractors, and project stakeholders to meet various local and regional codes and standards. This unique carport is on top of the 15-story parking structure. Careful planning was required to design the carport attachment as well as routing conduit all the way down to ground-level. This extensive and architecturally complex campus required a forward-thinking design solution, including both rooftop and carport PV arrays. 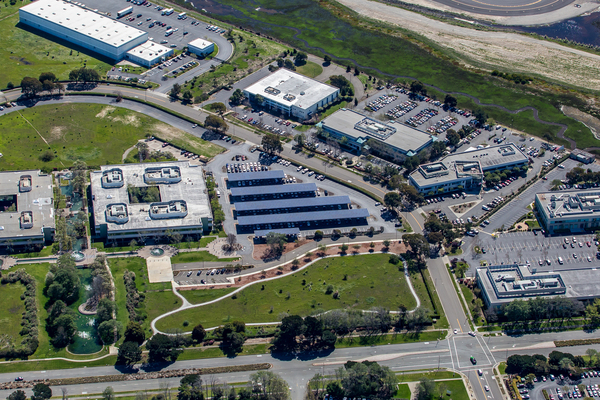 The Fortinet Solar Campus project is a 908 kW net metered distributed generation solar photovoltaic system that covers two rooftops and three parking lots to power this corporate campus. We defined the project and proposed the ideal solutions to exceed the customer's expectations. This project was engineered and constructed by Blue Oak in 2014 and we continue to operate the solar facility to meet the intended financial returns. 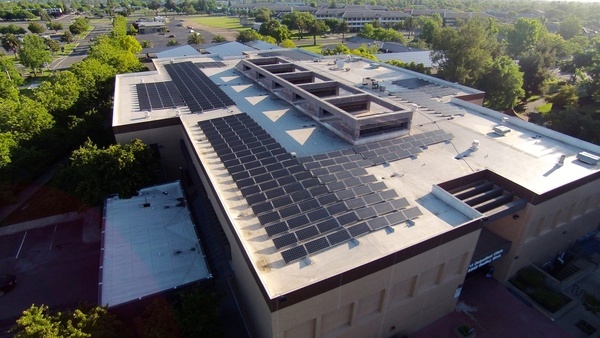 The USVA Sacramento project focuses on increased energy savings through installation of a commercial solar rooftop and solar carport system. This system expands on the previously installed rooftop system by adding an acre of carport solar panels for a total of three acres of solar arrays, with a total expected output of 558 kW. The newly installed carport system is expected to generate approximately 832,000 kWh annually, while the rooftop system will generate 60,800 kWh. 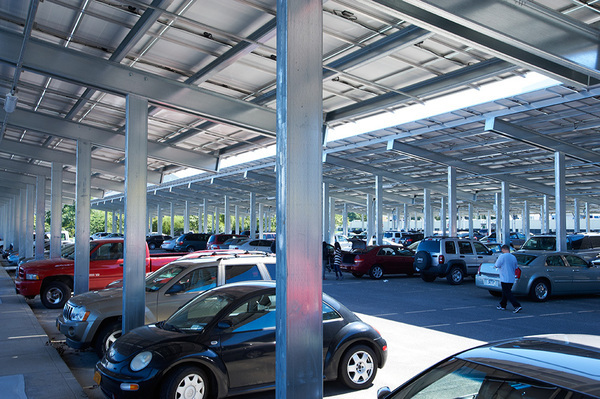 The solar carport system will also provide shade for vehicles and improved lighting at night. 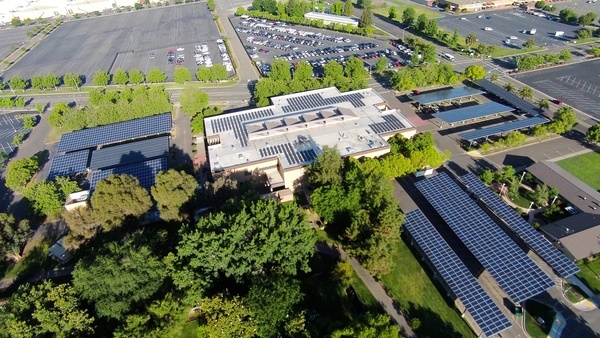 The entire solar generating facility will be interconnected and operate parallel to the Sacramento Municipal Utility District (SMUD). Solar carport structures are an excellent way to maximize an existing space for multiple purposes and benefits. In addition to generating up to 12.8 watts of energy for your business or utility, a PV carport provides needed shade for vehicles, and improved lighting at night. The additional light inherent in solar panel carports is actually a reflection created from the PV ceiling. For clients who desire an electric vehicle solar carport, Blue Oak Energy can incorporate one or more electric vehicle charging stations into the solar carport plan. 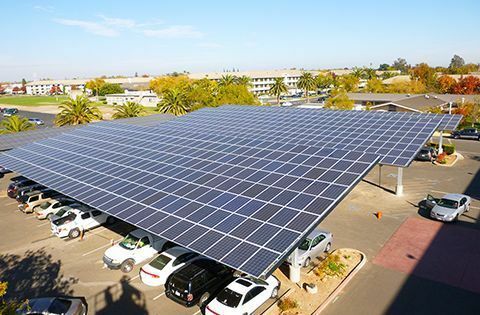 Many organizations in the commercial, public and government sectors have made the decision to integrate PV carports into their facilities and campuses. 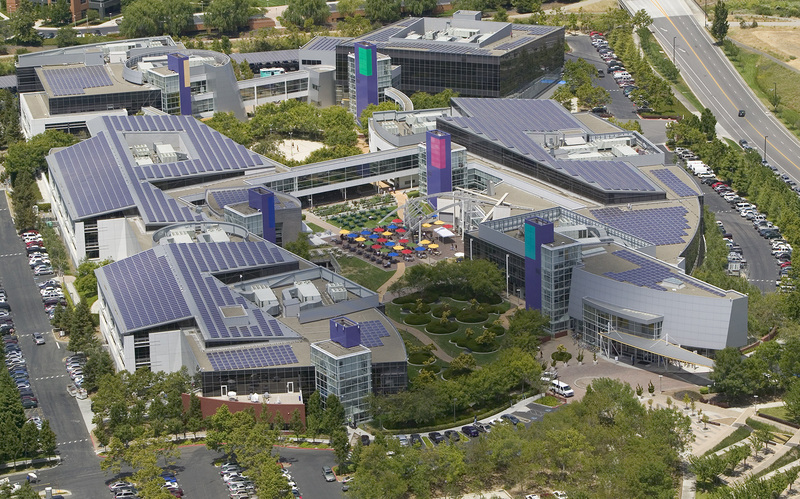 The commercial solar carport at the Google campus is one example of using PV carports to maximize energy production from a larger solar project. Smaller scale additions, such as the solar panel carport that sits atop the Venetian hotel parking garage, reap benefits as well. Blue Oak Energy has installed solar carport structures for several clients from the public education and the military sectors. 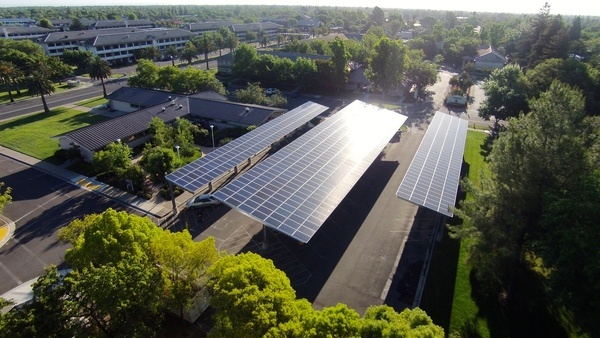 As part of a an extensive solar project at the U.S. Marine Corps Air Ground Center in Sacramento, Blue Oak Energy added one acre of carport solar panels to an existing solar renovation project to create a total energy generation of 558 kW. Public sector projects, such as the Eastern Long Island Solar Project (ELISP) rely on a PV carport campus to generate utility-scale power that feeds directly into the local electric utility. ELISP boasts 21 acres of solar carport structures across six sites in a single county, producing a total of 12.8 MW of power. Many factors enter into the successful installation of a solar panel carport. There are requirements for degrees of tilt, but also for soil, lighting and foundation design. When deciding on solar carport frames and ground mounts, Blue Oak Energy takes into account geotechnical issues and soil composition. Our engineers must design footings so that they can support lateral loads. Solar carport structures may include a mix of ballasted and positive anchoring, depending on the geographical needs. 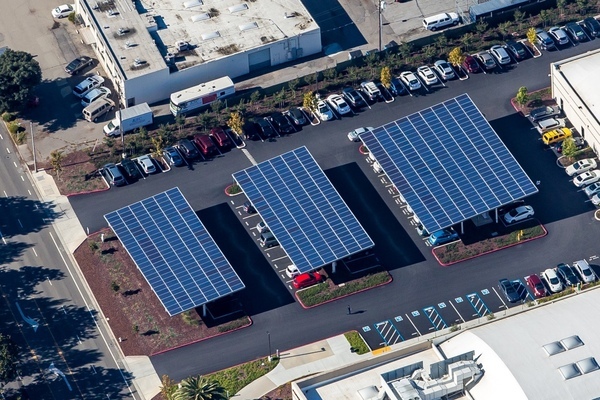 A typical parking lot has no value other than the storage of cars, but when an existing space is turned into a solar panel parking lot, it’s a win-win situation. Now the lot is also a power generator and shade producer. 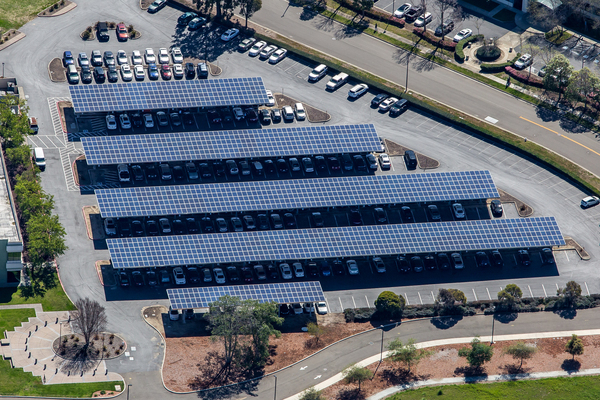 Numerous Blue Oak Energy solar carport projects have shown the logic and efficiency of converting existing parking spaces into solar panel parking lots. Blue Oak engineers use careful planning so that facilities can continue to be operational during the installation process. 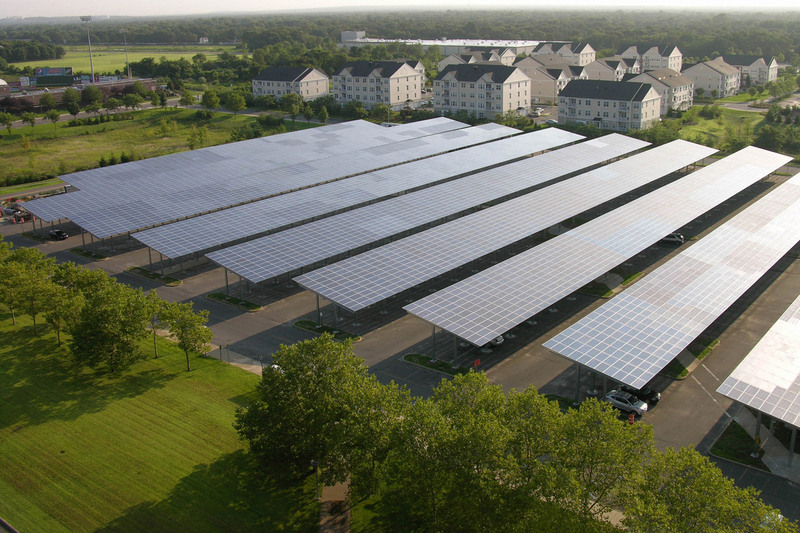 The Eastern Long Island Solar Project (ELISP) is an example of an extensive solar panel parking lot project where Blue Oak engineers were able to integrate solar panel structures with little impact during planning and construction. The resulting conversion now generates 12.8 MW of power. Government solar parking lots, such as the U.S. Marine Corps Air Ground Center in Sacramento, demonstrate Blue Oak Energy’s ability to adapt solar structures into a pre-existing complex, even under tight deadlines. There are also many instances of commercial solar parking lots benefitting from conversion. 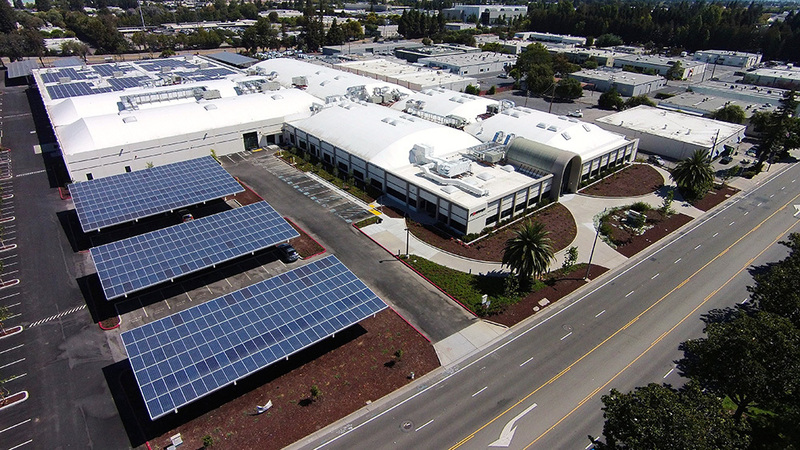 The Fortinet solar campus in Sunnyvale boasts three commercial solar parking lots, part of a more extensive system that also includes rooftop PV. Solar canopies are an innovative product that can turn a typical, non-productive parking lot into a cost effective solar power plant. 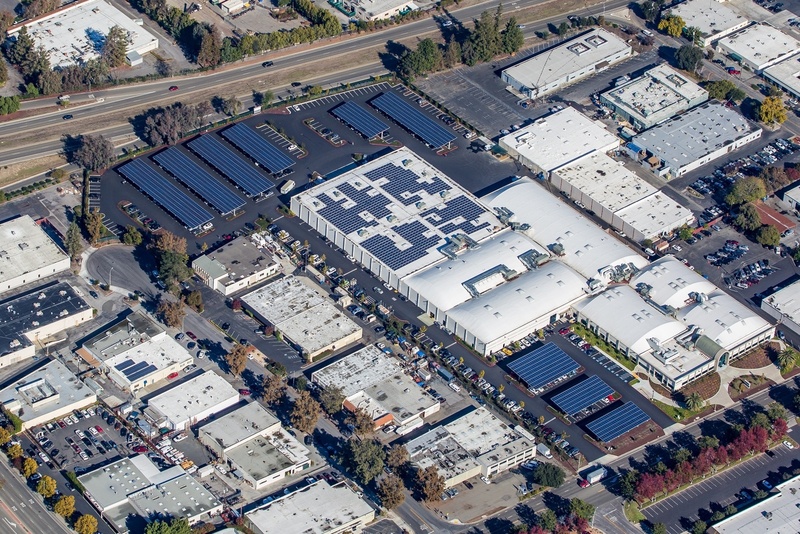 Blue Oak Energy can install steel frame solar canopies on almost any existing parking lot to create a shade producing facility that also generates up to 12.8 MW of power, depending on the site size. Solar canopies are supported by posts, and in North America are generally tilted ten degrees to the south or west. In addition to producing clean energy and shade, the solar canopy also gives off valuable lighting at night to aid car owners and increase safety. The lighting is due to a special material located near the solar canopy ceiling that reflects light from the pavement below. 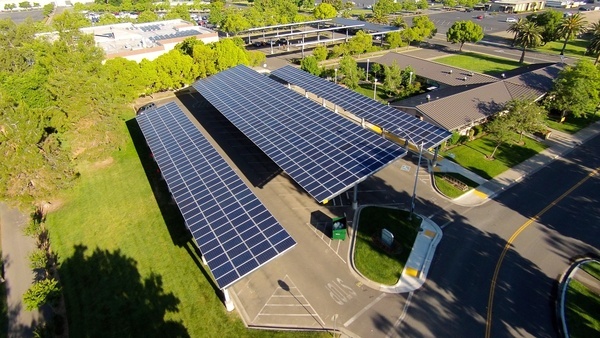 There are several ways to incorporate solar canopies into a pre-existing commercial site or parking facility. 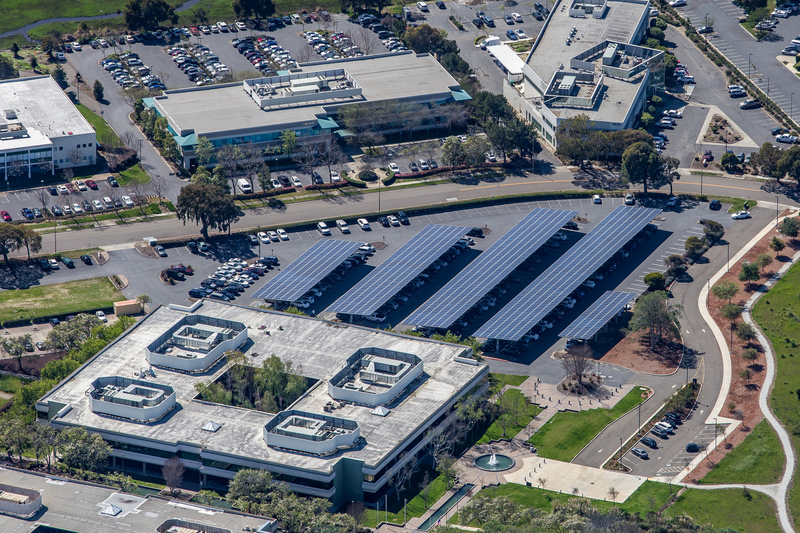 Blue Oak Energy has successfully installed commercial solar canopies on large corporate campuses, such as Google and Fortinet, as part of more extensive renovation projects. 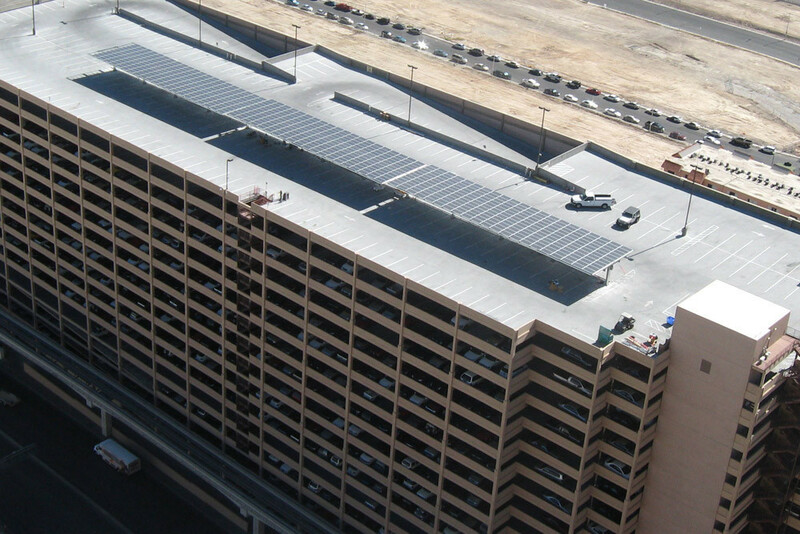 With the Venetian Hotel project, Blue Oak engineers placed steel framed solar canopies on the roof of a pre-existing parking garage in Las Vegas to create an additional solar parking structure that also provides shade to vehicles. Whatever solution fits your commercial solar canopy project, you can be certain that the upgraded facility will generate valuable cost savings and a more beautiful and comfortable parking experience. 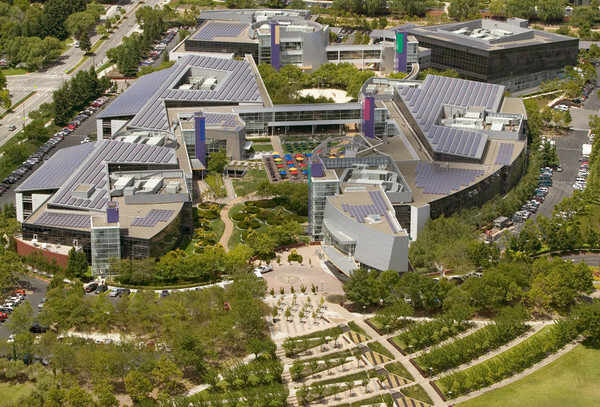 Why is Commercial Solar a Good Investment?